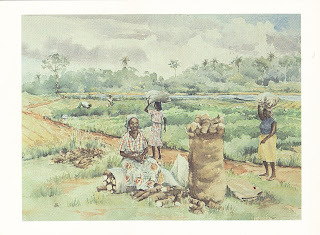 Postcard US-3957035 to Belgium shows a watercolor painting Cassava Harvest by Dorothy B. Hayes. Cassava is a perennial woody shrub with an edible root, originated from tropical America and was first introduced into Africa in the Congo basin by the Portuguese around 1558. Because Cassava is rich in carbohydrates, calcium, vitamins B and C, and essential minerals, and grows well in poor soils with limited labor requirements, it becomes the main nutrition source for 500 million people in Africa. It also provides food security during conflicts when the invader cannot easily destroy or remove the crop, since it conveniently grows underground. Roots can be harvested between six months and three years after planting. Africa accounted for 63% of Nineteen million hectares of cassava planted worldwide in 2007. Although Cassava requires only 21% labor in terms of working days, compared to other staple crops such as maize, yam and rice, it does require intensive post-harvest processing as the roots are highly perishable and need to be processed for storage soon after harvest. 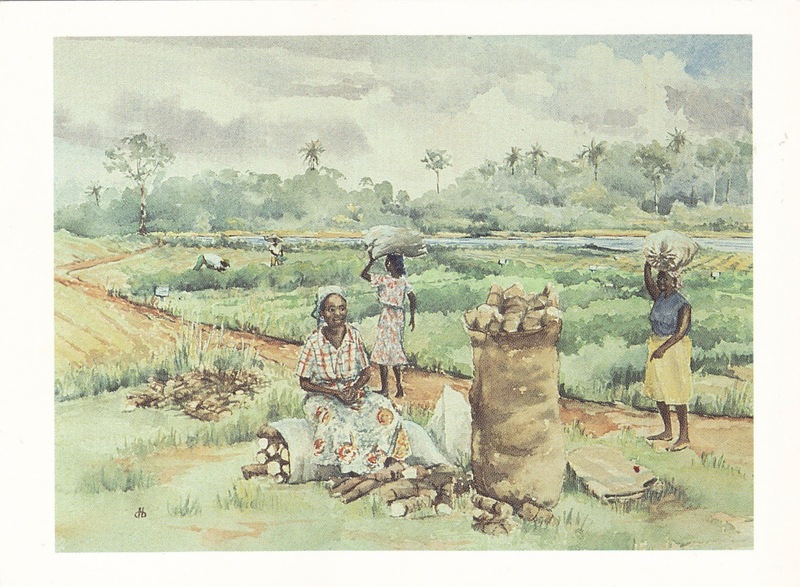 The postcard was produced by IITA-UNICEF Program on Household Food Security and Nutrition, International Institute of Tropical Agriculture, Ibadan, Nigeria.